Summary: Fifteen year-old Snow is mature beyond her years. Girlfriend of an eighteen year-old with his own apartment and caretaker of her grandmother who may have mental health issues but is definitely an alcoholic, she reaches her breaking point when her grandmother’s boyfriend tries to molest her in the middle of the night. For her own safety and protection, Snow moves into a group home and is determined to finish high school, until she learns the devastating news that she is pregnant. As her world slowly crumbles around her, she learns truths about her family history that leave her convinced her unborn daughter will face the same fate as Snow and her mother. Review: Starting out as a responsible, serious, yet somewhat self-destructive character, Snow seems like she will be able to escape her grandmother’s poor parenting in the place of her dead mother. Moving to a group home may not be understood by others around her, but it was actually the best decision she could have made to protect herself. But when she finds out she is pregnant, everything changes. Her life spirals downward as Snow contemplates whether she wants to keep and raise her unborn baby, or if adoption is in the baby’s best interest. Finding out the true nature of her own conception and birth, as well as Snow’s mother’s death doesn’t help matters. It’s all too much for one person to reasonably handle, and for one person and a baby, it’s simply overwhelming. Snow’s essay about what a good mother was NOT was enlightening. Even though she didn’t know what a good mother was, she knew what a good mother wouldn’t do, unfortunately pretty much all of the things her grandmother had done while raising her. I admired Snow’s initial dedication to providing a different life for her daughter, but when Betty was born and Snow had no feeling for her I was deeply concerned. Are the right actions enough if there is no feeling or love behind them? Does love develop from going through the motions of parenthood? And if it doesn’t, will Snow end up resenting Betty instead of Snow’s prediction that Betty will resent her? I liked Snow’s observations about how the focus shifted from her to her baby as soon as people found out she was pregnant. First the people supporting her at the group home missed the fact that she was pregnant for six months, and then the focus immediately switched from Snow to her unborn child. If Snow has any hope of being a good mother, she needs help to deal with her pain first so the cycle of bad parenting doesn’t start all over again, wounding the next generation. It’s a challenging, sexually graphic read that won’t rest easy with readers. Cowen’s writing is skilled and vibrant, taking readers down into the depths of Snow’s depression and self-harm. I can’t decide whether Snow’s story will have a happy ending or not. Her cutting and lack of feeling for Betty suggests it won’t, but Children’s Aid involvement means maybe Snow will get the support and counselling she needs. I hope she does, because otherwise Betty seems to have a bleak future ahead of her. “And so I have three voices: one in my head, one in my mouth, and one in my hands. Each speaks a different language, but it’s the voice in my head that matters most; the one that understands things. It’s in my head where I understand Elsie’s belief that the easiest place to lose yourself is in a bottle. It’s in my head where I find certain things depressing because I see myself in them, like a fountain in the rain or a running shoe on the highway. Only, my mouth doesn’t understand this language. It tries, but it confuses the vocabulary and things end up sounding simple or angry or dull. “How do you describe love, good love, to someone who has never known it? It’s like describing snow to someone who’s never seen it. How can you describe something that’s beautiful and ugly at once? Something you can both appreciate and resent. Something that’s cold but can feel so warm. How do you describe that love’s all about balance? Too little and it will melt away, too much and it will break you. Now, how do you describe all this if you yourself have never seen snow? 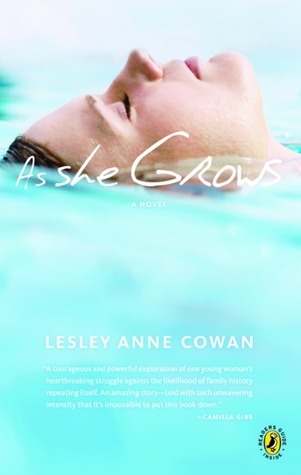 As She Grows by Lesley Anne Cowan is published by Penguin Canada, (2003).